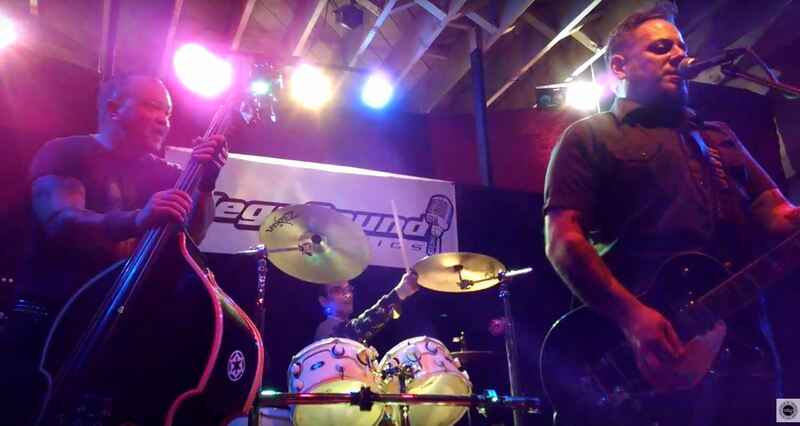 Ventura’s outlaw punkabilly trio Hard Six launched “Behind the Lens,” an exhibit of 19 photos of the band shot by 10 Southern California photographers, with a reception at Megasound Studios in Ventura on Friday night, January 28, 2017. 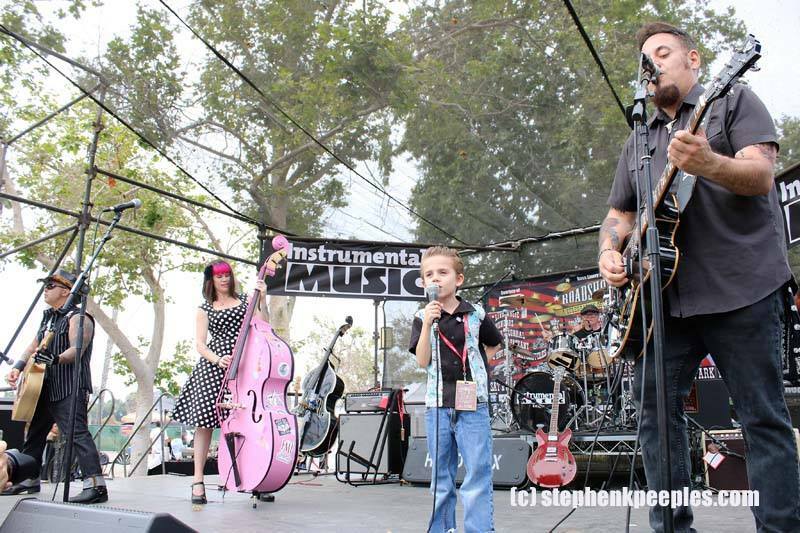 ‘The Family That Rocks Together Stays Together’ by Stephen K. Peeples catches Ventura’s Hard Six onstage at the 2016 Roadshow Revival festival. The band included the photo in their ‘Behind the Lens’ exhibit at Megasound Studios in Ventura, on display Jan. 28-March 25, 2017. A few hundred fans, friends and family turned out during the evening to help Fuse (guitar, vocals), Vogelcide (bass) and Six (drums) celebrate the exhibit, which hangs in the Megasound Hallway of Stars through the end of March 2017. 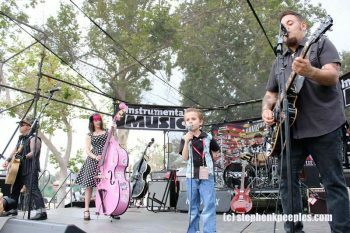 Among the photos the band chose to feature in “Behind the Lens” was one Santa Clarita journalist-producer-photographer Stephen K. Peeples shot at the summer 2016 Roadshow Revival roots-rock festival in Ventura. Hard Six’s “Behind the Lens” exhibit at Megasound (not to be confused with famed rock photographer and Morrison Hotel Gallery co-founder Henry Diltz’s touring slideshow) provided the perfect excuse and venue to throw a party and kick out the jams. So the band set up their gear on a soundstage and ripped it up with a bunch of originals (including the title track of their latest album, “Haunted Ride”) and a bunch of choice covers. Hard Six has many friends and fans in the L.A. and Ventura music community, and the band invited them to sit in for a song or two each. Sitting in with Hard Six was a bucket-list dream come true for Peeples. He’d first seen them live in 2013 and booked them that December for a performance and interview on his “House Blend” TV show on SCVTV in Santa Clarita. “Hard Six blew the roof off the SCVTV studio when they taped ‘House Blend’ – I love their passion for the music, and they’re excellent players,” said Peeples, 66, a drummer since he was 12 years old. The Hard Six “Behind the Lens” exhibit and jam capped the first day of a mini-road trip with Texas artlaw Boyd “El Chingadero” Elder. He was in L.A. for the weekend to visit friends including Peeples, en route to the Big Island of Hawai’i to spend time and create new works of art with one of his daughters, Flaunn. As if Fuse, Vogelcide and Six needed another excuse to jam, Hard Six will throw a closing party for their “Behind the Lens” exhibit at Megasound on Saturday, March 25, starting at 8 p.m. Check out the Facebook event page. Get more info about Hard Six at the band’s official website. Santa Clarita journalist, PR consultant and website producer Stephen K. Peeples began his career writing about American music and pop culture for Cash Box, the Los Angeles Times, L.A. Weekly, Circus, Picking Up the Tempo, Modern Recording, Performance, Rocky Mountain Musical Express, Rock Around the World and other publications from 1975-1977. He is a Grammy-nominated record producer (“Monterey International Pop Festival,” MIPF/Rhino, 1992), a veteran record industry media relations executive (Capitol Records, Elektra/Asylum Records, Westwood One, Rhino Entertainment, 1977-1998) and website content manager (Warner New Media, 1998-2001). Peeples was the original, award-winning producer of “The Lost Lennon Tapes” radio series for the Westwood One Radio Network from 1988-1990. He was music and entertainment features writer/columnist for the Santa Clarita Valley Signal (2004-2011), and The Signal’s award-winning online editor (2007-2011). He wrote news and features for Santa Clarita’s KHTS-AM 1220 News (www.hometownstation.com) and SCVNews.com (2011-2016), and hosted, wrote and co-produced the WAVE-nominated“House Blend” music and interview show on SCV community TV station SCVTV (2010-2015). Peeples was also Vice President/New Media & Editorial with Los Angeles-based multimedia pop culture company Rare Cool Stuff Unltd. (2010-2016). As a web producer, he was project manager of sites for clients including Santa Clarita Photographic Studio and Rare Cool Stuff. In 2015, pursuing his other passion, animals, he co-founded Pet Me Happy Treats, created an all-natural treat for dogs, and co-produced the company’s website with associate Paige Hagen. For more information, email skp (at) stephenkpeeples.com or visit http://www.stephenkpeeples.com.